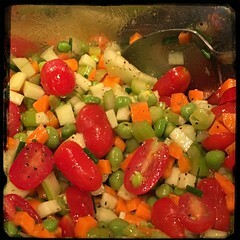 This simple salad is a wonderful celebration of summer especially when you add garden fresh ceci (chickpeas). 1. Remove the pods from the bush, rinse and drain. 2. Place pods in pot, fill with water and bring to a boil. 2. Once the chickpeas come to a boil, remove, drain and toss into ice water for a few minutes (to cool down). 4. Once the pods are cool enough to handle, pop open the pods and remove ceci. 1. Toss the chickpeas, carrots, celery, cucumber, green onion (chives), flat-leaf parsley and cherry tomatoes together with the olive oil, white balsamic vinegar, salt and pepper.